Q. Why doesn’t consideration work as the answer? 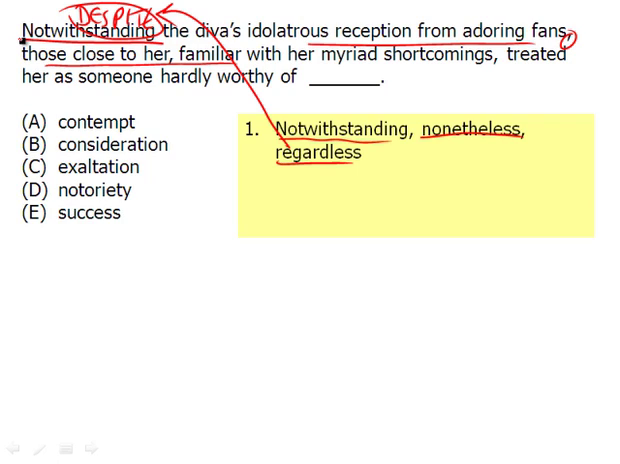 The sentence is setting up a contrast ("Notwithstanding") between public opinion of the diva ("idolatrous reception from adoring fans") and "those close to her" ("familiar with her myriad shortcomings"). OK, in this text completion, you'll note that things are a little trickier. First off, there's this word. It's a long word. It's a confusing word. It's "notwithstanding". The function of notwithstanding is simply that of a reverser. It's no different from "however", in that it takes the sentence, and as long as we have that comma, it splits the sentence into two parts. And these two parts are in contrast to one another. So again, it reverses the meaning of the first part. So you can think of despite as a good substitute for notwithstanding. However, there are some others that we haven't gone over yet. Some are nonetheless and regardless. These are important other reversers. However, if you were to put those in word for, maybe it would kind of work. "Regardless of the divas idolatrous reception" and "Nonetheless, the diva had an idolatrous reception from her adoring fans." Nonetheless. You could see same function, but maybe, you'd have twist up the grammar a little. So I like to use despite as a substitute for "notwithstanding", but again, all three of these words are reversers, or sentence shifters. So "Despite the diva's idolatrous reception those close to her, familiar with her myriad shortcomings, treated her as someone hardly worthy of ________." So again, we have to note kind of the complexity of the sentence because not only do we have this notwithstanding reverser, but the second part of the sentence doesn't just say, "OK, well, we need to come up with the opposite from 'for adoring fans.'" So those close to her were not adoring of her. So therefore, they treated her as someone hardly worthy of not adoring. We want to note this role of the word 'not'. When you have here this double-shift in the second part of the sentence, that is, the part after the comma and there's also multiple commas, again, going back to the complexity of the sentence. It's that the part after the comma is in opposition to the first part. It doesn't even matter if you have these multiple commas. So you're only going to get this one shifter in terms of reverser in terms of the word. But then when you get down here, you can see that it's like saying she's somewhat not worthy of adoration. So you're kind of reversing it again, being that you needed a word meaning the opposite of adoring for the second part of the sentence. But by saying "hardly worthy of", you're more or less saying 'not.' So it does the double negative and takes us back to not worthy of adoration. Notoriety means vain, but usually in a negative sense. We want a word that's more similar to adoring, adulation and, of course, this whole idea of idolatrous as though she's this great idol. So again, exultation works best, and success doesn't really talk about adoration. She may be successful, but they're not saying she shouldn't be successful. They're just saying, "Don't treat her as though she's perfect like an idol or a goddess." So again, the answer is C.